Temping has been around likely longer than you have been alive. It is a great opportunity for those that are in between jobs, looking for a new career path, and for travellers alike. There is a common misconception that temping is easy work, but coming from the source itself and from someone who has temped in the past, it is not easy. 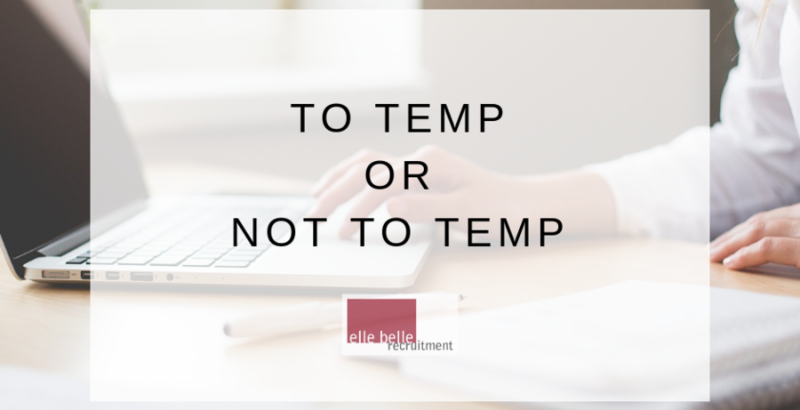 To be a temp you need to be very adaptable, you will likely be going into a new situation each time you set off for your work day and being adaptable and flexible to each situation you walk into is essential for success. You need to have thick skin. You might walk into your new temp role thinking it will be smooth sailing, but Donna in accounts might be comparing you to your predecessor all day, Rick in Sales might give you the biggest pile of filing you have ever seen and expect you to get through it before the end of the day. Now we are not trying to scare you away, temping can be difficult, just like any job, but it can also be one of the most rewarding things you will do. You will learn a lot along the way and come out of each situation with skills and tips that you may have never otherwise learned. You will also make many connections along the way that could serve you very well in your future career path.